I realised about halfway through The Abyss that we should’ve started with The A-Team. It was an oversight on my part which I apologise for. Since I like the sound of “From The Abyss to Zoolander” more than “The A-Team to Zoolander” the original order stays. There has also been some complaints about the fact numbered movies aren’t first, but I won’t hear of them. I have always listed numbered movies alphabetically and that’s not changing now. Anyway, onto the review. I hadn’t watched this movie since I saw it at the theater in 2010. I remember enjoying it then, but the second viewing was not as kind. This is a standard action movie which is put on a pedestal due to the fact it is a nostalgic remake of a classic television show from the 80s and the cast is well known. Liam Neeson, Bradley Cooper and Sharlto Copley have all been better, although Copley steals every scene he’s in. He struggles to hide his South African accent throughout the film, but he captures the crazy Murdoch perfectly. After Taken was such a huge success, Liam Neeson has been able to transition into an action badass, but this is no Taken. Neeson’s Hannibal is nowhere near as charismatic as Bryan Mills from the Taken movies and he fails to capture the charm and wit George Peppard made famous in the 80s. Bradley Cooper was clearly cast because of his pretty face and the fact he had just headlined a massive box office hit in The Hangover. He tries hard, but at the end can’t capture the charm and smugness of Dirk Benedict’s ‘Face’ from the tv series. I think getting an MMA fighter to play B.A. Baracus was the movie’s biggest mistake, though, as Quinton ‘Rampage’ Jackson is clearly out of his depth when he has to share the screen with far more accomplished actors in Neeson, Copley and Cooper. Jessica Biel rounds out the cast as a cardboard cutout love interest for Bradley Cooper. Outside of Copley’s Murdoch, and an awesome action sequence involving a parachuting tank, there’s not much here you won’t find in any run of the mill action flick. If this wasn’t a remake of a classic 80s tv show, it would likely be instantly forgettable. 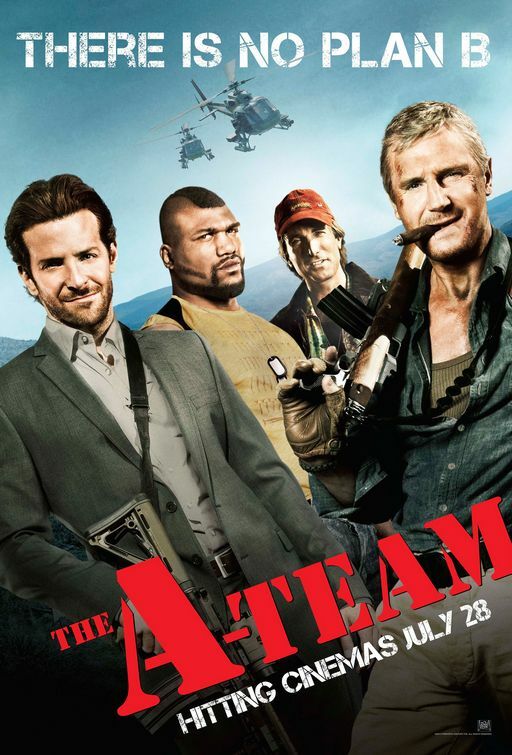 I’ve been trying to think of a quippy way to sum up The A-Team, but since this movie was neither witty nor clever, I’ll just go with my initial reaction: I pity the fools who watch this movie. I know what you’re thinking, “It’s a guy movie. Of course you don’t like it.” To which I respond, “I recently watched Die Hard and Die Hard With A Vengeance and loved them. So there.” Maybe next time give Bradley Cooper a Rubik’s Cube hooked up to a bomb to solve and then we’ll talk. On the plus side, Liam Neeson is great as always. It’s just obvious that he’s so much better than this. The same can be said of Sharlto Copley, who I’ve previously only seen in dramatic roles. He does well with comedy, and I’d like to see him explore the genre more in the future. Bradley Cooper is, well, Bradley Cooper. Charming and handsome as always. Jessica Biel was actually quite good, but it feels like her character was just thrown in there as the token female. And I honestly had no idea who Quinton ‘Rampage’ Jackson was prior to this, but as a former UFC fighter in his first real acting role, I think he did a fair job. Crossing my fingers that future Hollywood will leave 80s television where it belongs– in the 80s.